I've got a new site at https://sherriepetersenbooks.wordpress.com. Come visit me there! I'm on vacation for the next few weeks, 6K into my next novel and writing every day. I'll be back with more book reviews, giveaways and a few interviews starting July 21. I had the chance to add more than 1,000 followers to my Twitter account last week. It was tempting. I mean let’s be honest – who doesn’t want to believe that there are thousands of people who want to hear what you think about books and writing and more? The only thing that held me back? The cost. And I don’t mean the $25 charge for adding their Twitter handles to my account. One of the things I love about Twitter – about the internet in general – is the way it allows us to connect with other people. Last week Andrew Smith favorited and retweeted one of my tweets. And yes, I had a major fangirl moment ☺ I live in a tiny town in California with a population of less than a thousand people. And yet, I shared mini conversations with people in Canada, Florida, New England – even a guy in Africa. How cool is that? I wouldn’t have had these conversations with people I bought from a list, people who may not even know their name was on the list. We had these conversations because we share a common interest. And finding those people to connect with – people who like books and reading, writing and publishing, movies and music – that’s half the fun. Finding and making those connections. Not buying them. I may not have as many followers as some of the people who’ve been doing it longer. But I’m content to find those people over time. So that when we do find and follow each other, we’ll share a real connection. Maybe even have a memorable conversation. That’s worth more to me. That’s priceless. Congratulations, Danielle! I'll be sending your book out later today. I hope you enjoy reading it! And if anyone is looking for some more good reading, Lucy Silag from Book Country interviewed me on their blog today. This Penguin community for writers is a great place to meet critique partners and get your work read in a public forum. WISH YOU WEREN'T is an Editor's Pick this month (yay!) and I was thrilled that they wanted to profile me. If you'd like a chance to win your very own copy of WISH YOU WEREN'T, don't forget about the other two blogs I mentioned yesterday. Sheri Larsen at Writer's Alley interviewed me and she's giving away a print book and an e-book. And the delightful Rosi Hollinbeck, a reviewer for the San Francisco Book Review, posted her review of WISH YOU WEREN'T on her blog, The Write Stuff, and she's giving away a print copy. Oh, and one more thing! If you live in Santa Barbara County and want to learn more about writing for middle grade readers, I'm leading a workshop at the Solvang Library with three other authors: Valerie Hobbs (Sheep), Gwen Dandridge (The Stone Lions) and Kimberley Troutte (Saving Miner's Gulch). The workshop is on Saturday from 1 to 3:30 and we'll be doing a book signing from 12 to 1pm. To find out more, you can visit the library's website. I'd love to see you there! 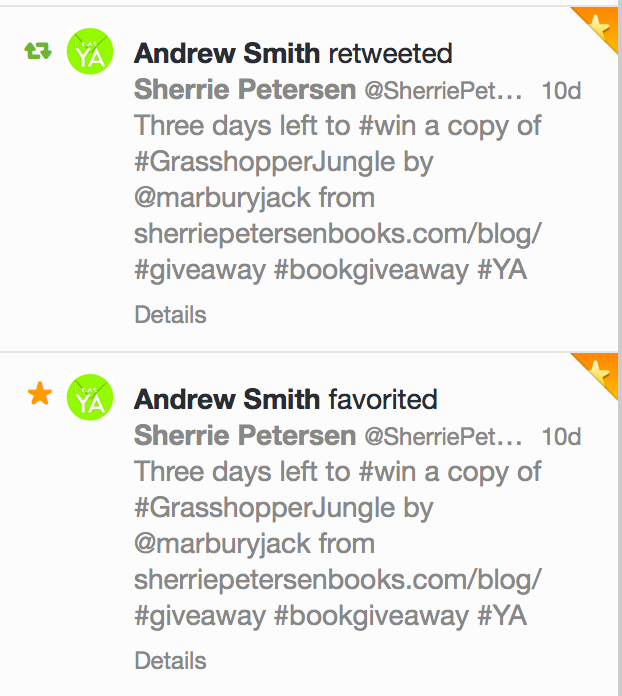 You were probably expecting a post today announcing the winner of GRASSHOPPER JUNGLE. But since I entered the wrong date on the Rafflecopter, there's still a few hours left to enter the contest. If you haven't already signed up to win, do it now. I'll be back tomorrow to let you know who won. In the meantime, if you've been wanting to read a copy of WISH YOU WEREN'T, there are three copies up for grabs on two different websites. Somehow I lucked out and two different bloggers featured my book for Marvelous Middle Grade Monday! Sweet! Sheri Larsen at Writer's Alley interviewed me and she's giving away a print book and an e-book. And the delightful Rosi Hollinbeck, a reviewer for the San Francisco Book Review, posted her review of WISH YOU WEREN'T on her blog, The Write Stuff, and she's giving away a print copy. Thanks to both of them for their generous giveaways. Now it's all up to you. Go forth and win! The 2014 Boston Globe-Horn Book Awards for Excellence in Children’s Literature were recently announced. And the winner in the fiction category? Grasshopper Jungle by Andrew Smith. But the backbone of the story – the relationship between Austin, his girlfriend and his best friend – make it a worthwhile read. Even if you do have to suspend your disbelief as an enormous grasshopper makes a meal out of the chemistry teacher. Or when you happen upon chapter titles like, "Never Look for Ice Cream in a Sperm Freezer." You can read The Horn Book review here. But if you'd like to read this YA novel for yourself, I'm giving away my ARC. Fill out the Rafflecopter below for your chance to win! Let’s Review – Goodreads or Point of Purchase? I've been somewhat of a slacker recently on Goodreads, actually with reviews in general. I used to write reviews for books whether or not I liked them, but that took a lot of time. So I started only writing reviews for the books I loved. Then after hearing about the rise of fake reviews, I stopped reviewing all together. But the thing is – fake review or real – I read reviews before I buy a book. And having my own book out there makes me realize how important it is to have those reviews from real readers. (I'm so grateful to every person that has ever written a review of my book, even if it wasn't a glowing review. I just appreciate their time first in reading, and second in writing the review.) So the question remains: how do you get legitimate reviews for a book without begging, bribing or otherwise paying for them? And where do people look for reviews? Goodreads? Amazon? Barnes & Noble? Or old-fashioned word of mouth? I love reading the reviews that come through my Goodreads feed, telling me what books my friends have read. (And if we aren't already friends over there, send me a friend request!) I have definitely read someone's review and then gone online to buy the book. But otherwise, I tend to just look at the reviews at whatever online portal I'm buying the book from. What about you? Do you generally review books that you read? How much do reader reviews inform your purchases? And where do you go to find reviews? And speaking of Goodreads, author friend Dawn Malone is giving away 10 copies of her new novel, Bingo Summer. Pop on over to enter for your chance to win! I started making up stories as soon I could hold a pencil. Now I use my MacBook, which is nearly as portable as a pencil. In addition to writing middle grade novels, I moonlight as a graphic designer, substitute teacher, freelance writer, school newspaper advisor, and mother of two children. Share book reviews and ratings with Sherrie, and even join a book club on Goodreads. Read it. Write it. Dream it. Can I Get a Side of Reality With That?